The Public Relations / Information Officer is Glen Parker. He can be reached at 214-803-4954 or glen.parker1948@gmail.com. The Ellis County Detachment 1452 was founded (Chartered by the Marine Corps League national headquarters) in May of 2017 and is based out of Ennis, Texas. The Detachment has seven (7) Board of Trustees with forty three (43) members (Regular and Associates) as of November 1, 2018. 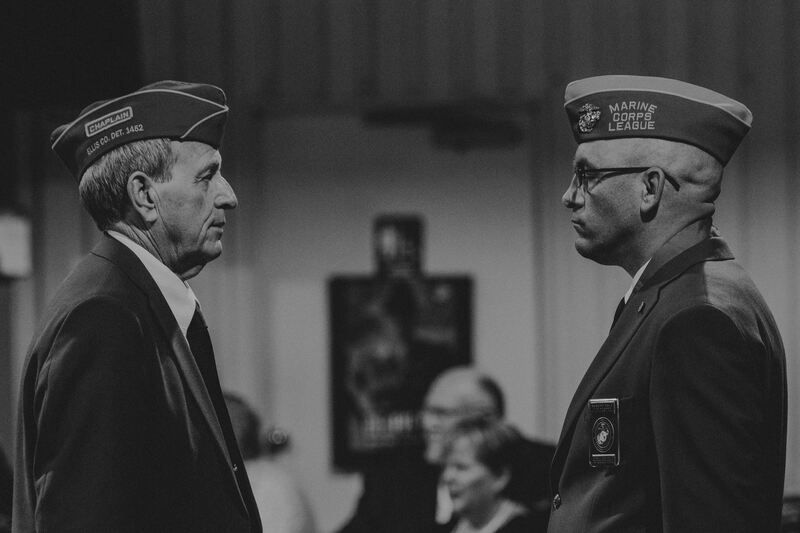 The Marine Corps League, along with all of its subordinate organizations (detachments) are individually registered as 501 (c)(4) nonprofit organizations within the Internal Revenue Code of the Internal Revenue Service. Being registered with the Internal Revenue Service, the national headquarters of the Marine Corps League has a Group Exemption (Group Exemption Number: 0955) which allows all donations to our Detachment to be tax-exempt as with any 501 (c)(3) nonprofit organization. As a nonprofit organization we are also incorporated within the State of Texas as our own corporate entity. Lastly, we are registered with the Texas Secretary of State as a Veterans Organization Solicitor allowing us to legally collect donation funds from the community. The Ellis County Detachment 1452 reached its Platinum GuideStar Nonprofit Seal of Transparency on Saturday, Oct. 13, 2018. By sharing metrics that highlight progress, the Ellis County Detachment 1452 is making toward its mission, the organization is helping donors move beyond simplistic ways of nonprofit evaluation such as overhead ratios. By updating our GuideStar Nonprofit Profile to the highest level possible, Platinum level, we can now easily share a wealth of up-to-date organizational metrics with our supporters as well as GuideStar's immense online audience, which includes donors, grant makers, our peers, and the media! The Ellis County Detachment 1452 was founded in 2017 by Marines looking to gather the vast number of Marines that the County has among its residents. It wasn't clear how the Marines would take the initial suggestion of creating a Detachment, but once "Attention on Deck" was called and the Marines had gathered to prepare for the mission ahead it was clear that the Marines had landed and the objective would soon be taken. Robert Bell, who founded the Detachment, has stated that, "Marines have too much leadership expertise and operational experience to be sitting on the sidelines not utilizing the skills that they honed while in the Corps. All of these skill-sets can be harnessed for the benefit of our fellow Veterans and our communities that we reside. Any one of us could start a club, but if we are going to do something great and make a difference in the lives of our Veterans then we need to do this with them in mind." From the Detachment's conception its members have wanted the organization to be a place where Marines can go for fellowship, camaraderie and support without the stigma of it being just a social club. One topic of discussion was that the vast majority of our members don’t smoke or drink; however, some do, and that’s okay. Though our members like to fellowship with each other at various functions and reminisce about the good times of the past, business still has to be conducted in order to accomplish our mission and purpose, which is to preserve the traditions and promote the interests of the Marine Corps by banding together those who are now serving in the Corps and those who have been honorably discharged, that we may effectively promote the ideals of American freedom and democracy, voluntarily aiding and rendering assistance to all Marines, their widows and orphans; and to perpetuate the history of the Corps. And, by fitting acts to observe the anniversaries of historical occasions of particular interest to Marines. We have a lot to look forward to in the years to come and these crucial first few years will establish our baseline in what we stand for and what our true intentions are, in relation to helping Veterans out any way we can. We have started our Military Funeral Honors, Honor Guard, which includes our Firing Party that will be able to honor our fallen and deceased Service members and Veterans at their graveside funeral or at their Memorial Service, at the family’s request. If a family is interested in this service, which is FREE OF CHARGE to the family and the funeral home, they would need to talk to the Funeral Director to request the service. We have also established our Detachment Color Guard that will represent not only the Detachment, but the Marine Corps and our National Flag in any event that it is involved. We are excited for what is to come and we ask that any Marines in the County look into our Detachment and hopefully you will be pleasantly surprised. Please click the links below to view each Press Release. Picture: Detachment Commandant, Robert Bell, (right), awards Life Member, Chaplain Dane Williams, (left), with the 2018 Marine of the Year award at the 2018 Marine Corps Birthday Ball on November 10, 2018. Picture: The Ellis County Det. 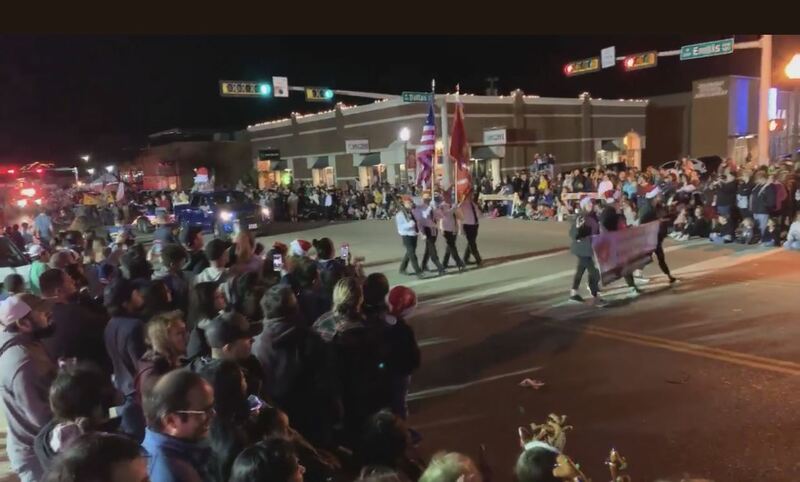 1452 Color Guard members march in the 2018 Ennis Parade of Lights in Ennis, TX as members right in the float that follows. Color Guard members Left to Right: Eduardo Salazar, Robert Bell, Brian Reel and Jose Salinas. 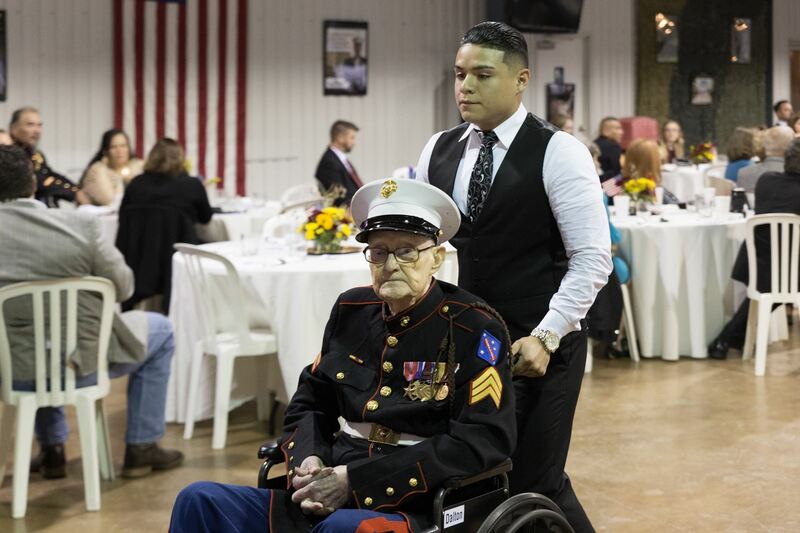 Picture: Ellis County Detachment 1452, Marine Corps Birthday Ball (2018), the youngest Marine present, Mark Vasquez, (right), escorts the oldest Marine present, R.V. Burgin, (left), during the cake cutting ceremony.